While reorganizing my pantry, I discovered that I had a bag of Ghirardelli White Chocolate Chips that, really I don’t remember buying. I don’t use white chocolate very often, but since I found I now have a bag that is only a few months shy of its expiration date, I wanted to bake something with it. First of all, what is white chocolate, anyway? It is a mixture of sugar, cocoa butter, milk solids, lecithin, and vanilla. Technically, it is not really chocolate because it does not contain any chocolate liquor, which is the smooth liquid paste which comes from grinding the cacao beans. It is this liquid paste that gives chocolate its flavor and color. Whenever I think of white chocolate, the first thing that comes to mind are these cookies. I love the combination of the salty macadamia nuts with the rich and creamy white chocolate. Macadamia nuts can often be hard to find and costs a bit more than other nuts, but these cookies are a splurge-worthy treat every once in a while. More fat produces flatter, crispier cookies. This is why bakers often use shortening instead of butter to get puffier cookies. 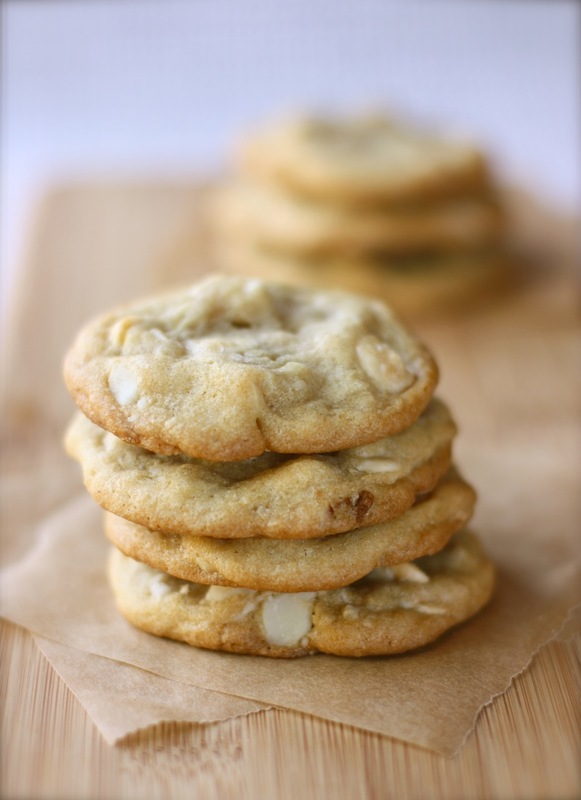 These White Chocolate Macadamia Nut Cookies have a delicious buttery flavor, but spread a little more due to their relatively high butter content and the addition of baking soda. Spreading can be minimized by re-chilling the dough balls after shaping. This cools the butter which helps the cookies retain their shape during baking. This article from All Recipes explains the role of each of the ingredients in the baking process. It also gives tips on baking the perfect cookie and even has a “troubleshooting” section that offers solutions to some common cookie-baking problems. It is a very informative article full of useful information. Check it out! Place butter in the bowl of a stand mixer fitted with the paddle attachment. Cream the butter until light. Add both sugars and beat until light and fluffy. Add the egg, egg yolk, and both extracts and beat until incorporated. Add the flour mixture gradually and mix just until the dough is incorporated. Stir in the chocolate chips and macadamia nuts by hand. Transfer cookie dough into an airtight container and refrigerate for several hours or chill overnight for best results. Roll the dough into desired size balls and press down slightly on the dough. Place cookie sheet with the formed cookie dough balls back in the refrigerator for about 30 minutes to prevent the cookies from spreading too thin. Preheat the oven to 350 degrees F. Line baking pan with parchment paper or silicone baking mat. Bake for 12-14 minutes or until the edges start to turn golden brown and slightly crisp and the centers are still soft. Let cookies cool completely on the baking sheet. Store baked cookies at room temperature in an airtight container for up to a week. Are they soft and chewy? Yes, they are. That’s how I like my cookies. THESE are AMAZING!! the best I have ever had. I just like to eat chocolates especially the dark chocolates because they taste yummy. Chocolates can also benefit your overall health and well-being.`*,:. They look great, are you measuring US cups? Do you have the recipe in grams? I definitly want to try it!!! wow, these look amazing! Such a fanatstic combination of all the very best things! I think Mrs. Fields taught us all to eat cookies with macadamia nuts in them. They are delicious. I think the only time I eat white chocolate is when I have these cookies. And then I wonder why I never have white chocolate on a regular basis. It’s just not my thing I guess? Thanks for the recipe!